This rustic authentic log cabin allows for the peaceful tranquility of the mountains or a home base for a variety of activities both local and nearby. A spacious family room with queen size fold out sleeper sofa and television with DVD player, two bedrooms each with a double bed, and one full bath make this cabin a perfect getaway for up to six guests. There is a fully equipped kitchen including microwave, coffee maker, toaster oven, and dishwasher. The cabin has both central heating and air conditioning for multi-season rental opportunities. An outdoor stone fireplace with a picnic table are located near the driveway in back of the cabin. River access is made by a long gradual walk along the ridge down to the river’s edge. There is no dock for swimming and fishing can be a little challenging due to trees and brush on the banks. Based upon availability, early and/or late check out can be arranged. •	Pets friendly-additional deposit may be required: $10.00/pet/night max of $ 30/pet/stay. * Maximum number of overnight guests on the property is 6 people due to county health department regulations. Cliffside cabin is located on a gated private gravel driveway which is 7 miles from Front Royal, VA. The cabin is three miles from the Shenandoah State Park and five miles from the northern entrance of the Skyline Drive of the Shenandoah National Park. Many of our guests enjoy local hiking, fishing, canoeing, and mountain biking and wine tasting at one of the thirty wineries within 30 miles of the cabin. Location, location, Location- Our cabin is the perfect home base for all your outdoor activities and adventures in the Shenandoah Valley. 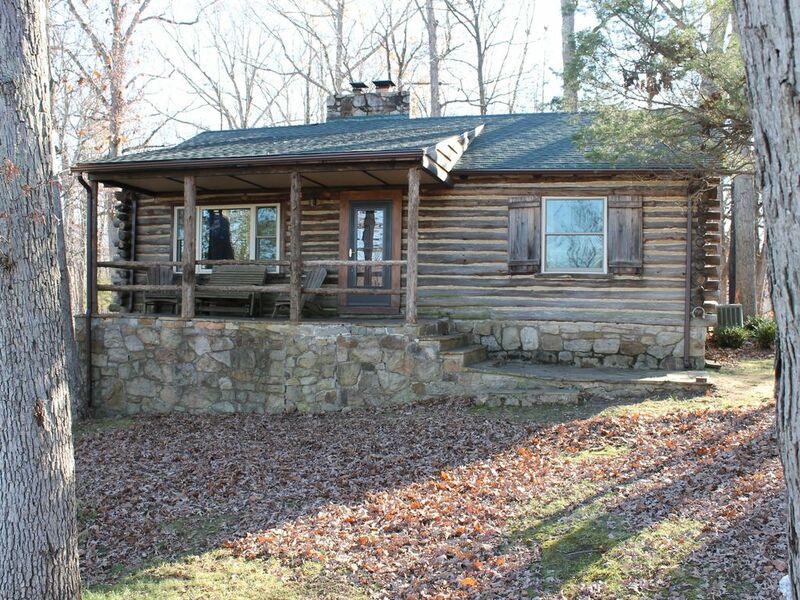 Our log cabin is secluded and built on a 100 foot cliff above the Shenandoah River with 35 acres of privacy. The Shenandoah River State Park and the Skyline Drive northern entrance are both only a ten minutes drive. The newly built Canopy Tours zip line was just open in the summer of 2014 which takes over 3 hour to complete. If you’re more interested in water activities; swimming, fishing or boating is all just a walk or 10 minute ride. There are over 30 wineries within 30 minutes of our cabin with new ones opening every year. We hope you will choose our home base for a memorable getaway. There is a pathway along the ridge line down to the river bank, but this walk can be a little challenging due to steepness of the hill. Not provided, but can be rented for $35 for your stay. Riverview Cabin was a great location for everything we wanted to do in the area during an action-packed long weekend. We enjoyed Fox Meadow Winery, Skyline Caverns, Shenandoah River State Park, Family Drive-In, and VA Canopy Tours. Cabin had everything we needed for 2 adults, 2 kids and a dog. Super comfy! We really enjoyed our stay - didn’t even turn on the tv in 3 days! Perfect meeting place for my family. Close to town yet still feels like you're "away from it all". Cabin is rustic feeling, yet has all amenities needed. Would definitely visit again. This review is of the property manager, not the property. Be sure to request the rules before paying for a reservation. You may be surprised by the rules and associated fines and penalties. The tone of the rules document is an indication of how you can expect to be treated by the property manager. Our cancellation policy is clearly posted on our webpage and is the standard VRBO policy. You forgot to mention in your comments that that you called to cancel your reservation at 5:00PM on the day of your arrival. We would have been willing to work with you, but you were so rude and unrealistic. No hotel would have offered you a refund under these conditions. We are sorry you were disappointed with your experience. I really enjoyed the cabin.. everything was nice and clean. The ad said their was satellite tv available, but that did not work, so we went out and bought some movies to watch. Other than that, we really had a good time. Thanks for writing a review and we want to apologize for the cable situation. We are glad your visit was good other than the cable. I have just issued a partial refund due to the lack of cable. We hope you will consider coming another time. Really enjoyed our stay here. Everything worked great, well maintained little hideaway in the woods. Perfect spot for a romantic weekend getaway. Please note, outside camping is NOT allowed on the property. In addition, the maximum number of overnight guests on the property is 6 people. We do NOT allow parties with outside guests on the property without written permission from the property manager.